Funnily enough, there was never any need for this. British Railways was formed from the private railway companies which had operated the country’s rail network until 1948. It was nationalised alongside various bus companies, ports, canals, and road haulage firms as part of the grandly titled British Transport Commission (BTC). The other major transport undertaking which had been subsumed into the BTC was the already publicly-owned London Passenger Transport Board (LPTB) which had overseen London Transport since 1933, developing the strong corporate image and branding which had been built up under the leadership of the now-departed chief executive Frank Pick. That identity was based on the London Transport roundel and consistent use of the Johnston Sans typeface. 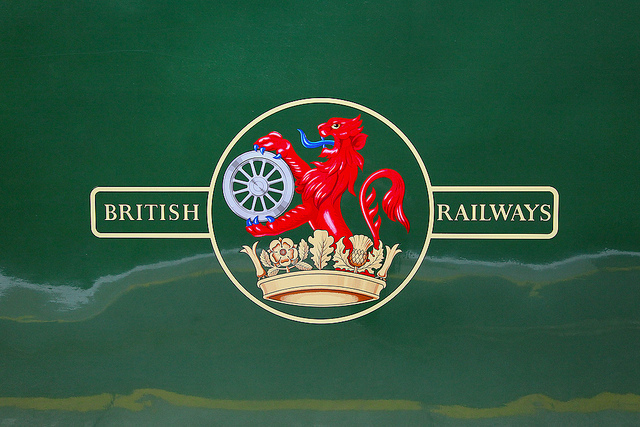 Despite this ready example of modern and attractive corporate identity resting within the BTC, British Railways started its life with no corporate identity of its own. It would be unthinkable today for a new transport operator to start up without a logo and corporate colour scheme of some sort, but the BTC didn’t seem to have thought about this in advance. In fact, the BTC’s subordinate Railway Executive (which oversaw British Railways) was positively hostile to the BTC itself, and in trying to avoid the imposition of the BTC’s own totem/seal (see below), it created the closest thing British Railways had as a logo, a sort of elongated roundel, unfortunately better known as the “hot dog sausage” totem, designed by the Railway Executive’s advertising officer A J White. The Railway Executive had actually sought London Transport’s advice on a logo, but the latter wanted to keep well out of the conflict between the BTC and the Railway Executive (Lawrence, 2016: p12). 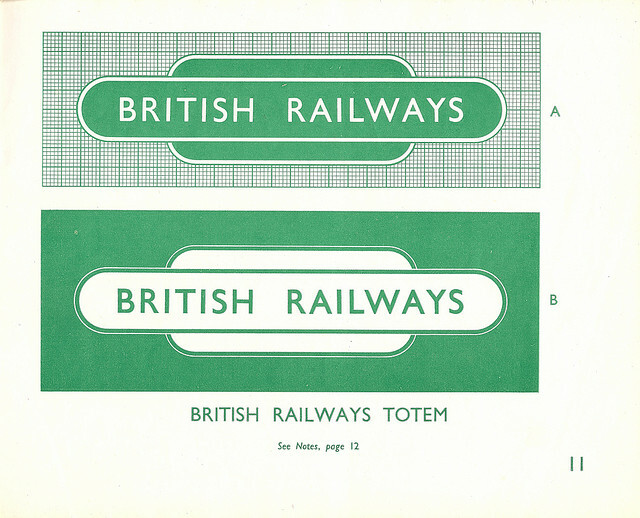 The hot dog sausage-shaped totem used both as British Railways’ corporate emblem and as the template for station platform nameplate signage, employing the Gill Sans typeface (which British Railways inherited from the London & North Eastern Railway, and more-or-less settled on as its corporate typeface from creation through to the early 1960s), where it became embedded in the nation’s consciousness, and is still remembered fondly to this day (see this earlier blog entry for more on these signs). It was not, however, a logo in the sense we would understand it today, nor in the sense that London Underground’s red and blue roundel had been deployed on its stations, posters and so on for many years. Although the British Railways totem could be seen on the front of station buildings, it was far from universally used. Stations would sometimes simply have their names written in Gill Sans on rectangular signs. It wasn’t even applied to British Railways’ trains. 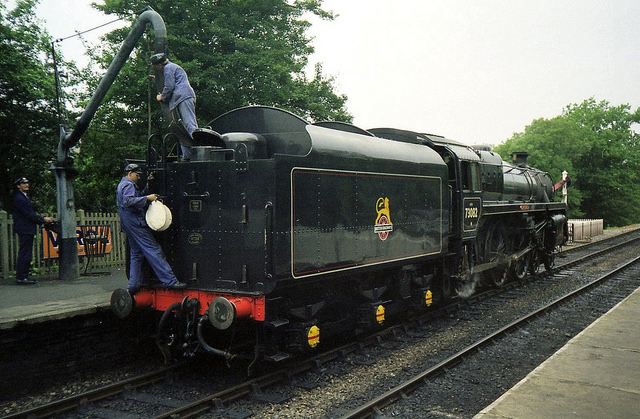 After several months in which the text “British Railways” was written on the tenders of steam locomotives, in whatever style the constituent company had used pre-nationalisation, the British Railways totem was applied to a single locomotive tender, where it apparently looked absolutely dreadful. Probably its size counted against it, as did the fact that it would have looked disconcertingly modern on a steam locomotive. 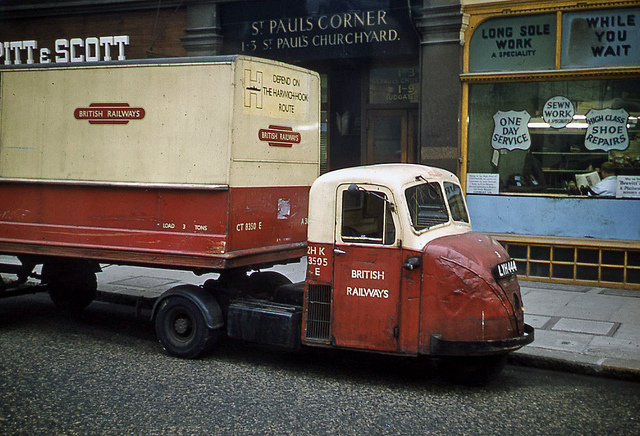 The totem did appear on printed publicity and also the road vehicles of British Railways. That left the trains themselves to be sorted out, i.e. the things that most passengers actually associated with the company. While the Railway Executive experimented with different colour schemes for its locomotives, carriages and wagons (during 1948, even though British Railways had been in existence for months) the hunt was on for some kind of emblem which could be applied to trains. The Railway Executive and BTC’s saviour in this matter is the subject of some confusion. According to Haresnape (1989: p12) it was Abram Games (1914-1996), a brilliant graphic artist who had already produced some excellent modernist posters and products and would later go on to devise the graphic identity for the Festival of Britain in 1951. Not so, according to Jackson (2013: p94) and Lawrence (2016: p11), it was the work of sculptor Cecil Thomas (1885-1976). 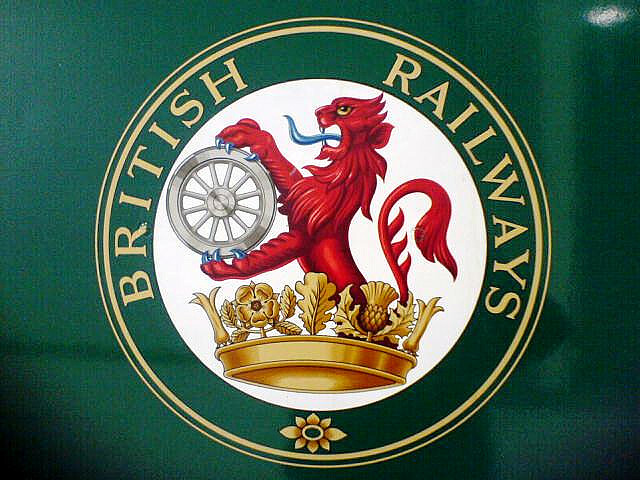 Whichever of them it was, they created the “lion on wheel” totem/seal for the BTC, which could be used for any of its subsidiaries, and it was the British Railways version of the BTC totem that was eventually adopted by the Railway Executive for use on locomotives. This image of the BTC seal seems to back up Jackson and Lawrence’s attribution, as it features Thomas’s signature. The most likely explanation for the confusion is that Thomas sculpted the original seal, while Games adpated it as the coloured lion on wheel used on trains. Whatever its precise parentage, it’s not universally admired, with many railway enthusiasts still sniffily suggesting that the lion looks rather emaciated. But for my money, it’s a stylish and dramatic piece of graphic design, the detail on the lion’s mane and its fierce countenance especially. What this emblem wasn’t, however, was in any way modern or forward-looking. It harked back to heraldic imagery via a sort of pre-war Modern / Art Deco style. The lion stands on what is clearly a steam locomotive wheel, despite the fact that British Railways already had many electric trains and some early diesel locomotives, all of which pointed the way to the company’s future. It’s not clear whether Games/Thomas were responding to the BTC’s brief or whether they viewed British Railways as an old-fashioned company (Games was apparently famous for producing designs and then resigning commissions if his client wanted something different). 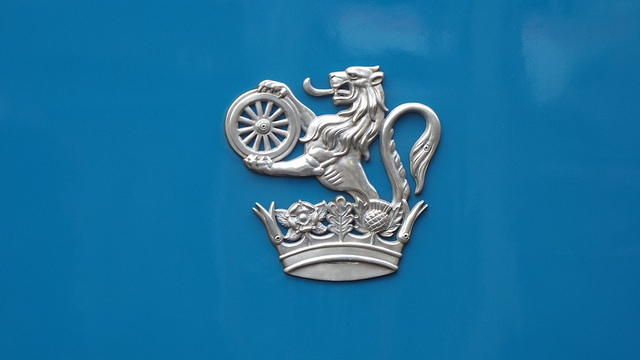 Either way, the lion on wheel, whatever its intrinsic artistic merits, looked much less modern than London Transport’s corporate identity, which dated from the previous decade. 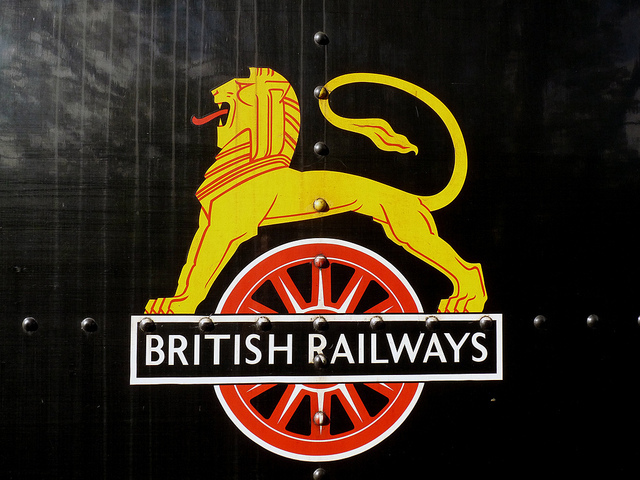 Despite the fact that Gill Sans was essentially British Railway’s corporate typeface, the lion on wheel emblem used a different typeface altogether, with different weights of diagonal strokes on the lettering particularly noticeable and obviously different from Gill Sans. The good news was that, despite the fact it was neither particularly modern nor in keeping with British Railways’ corporate typeface, nor was actually British Railways’ own totem, it looked super on British Railways’ trains. It was reversible, so that the lion always faced forwards on steam locomotives (many diesel engines had a cab at each end and could run in either direction, so the lion faced left on these, and didn’t always face the direction of travel). But again, it wasn’t a logo as such, because it was rarely seen anywhere but on trains. The trains themselves still failed to present a cohesive corporate image. Carriages were mostly being painted in two-tone red and cream, except in the Southern Region where carriages had always been painted malachite green, and this remained the case for its electric trains possibly because taking on the ex-Southern Railway’s corporate inertia was considered too difficult (it more-or-less refused to use the new red and cream colours on its locomotive-hauled carriages too). All this is the sort of behaviour you’d expect from a short-term franchisee in the modern privatised railway industry, not from a colossal public company which had no reason to believe it wouldn’t be around for years to come. Within a few years, even the BTC saw the need to put British Railways on a new path towards the future, and it launched a report called Modernisation and Re-equipment of British Railways (commonly known as the Modernisation Plan) in 1955. It remains one of the most colossal blunders in British transport history. The gargantuan waste of money it eventually proved destroyed British Railways’ reputation with government for decades to come, and led to the eventual appointment of British Railways chairman Dr Richard Beeching in 1961 with a remit to slash costs at the company, which he duly did. His Beeching Report (as The Reshaping of British Railways is generally better-known) of 1963 proposed closing down one-third of British Railways’ route miles, and only a handful of these lines escaped the axe. That was all to come, though. The Modernisation Plan called for the widespread introduction of new diesel and electric locomotives to replace steam locomotives within about a decade. This would have made more sense if British Railways hadn’t been building brand new steam locomotives since its creation, and right up until that point. These would now be scrapped long before their economic life was over, wasting huge sums of money. British Railways had enough diesel and electric trains at nationalisation that it must have known that these types of locomotive were the future, yet it persisted in building steam engines which the Modernisation Plan now cast aside. The Modernisation Plan then called for the introduction of small batches of many types of new diesel locomotives, several of which proved hideously unreliable, and were also withdrawn long before their intended lifespan was over, again wasting vast sums of money. To compound the problems, the Modernisation Plan also included the building of many huge marshalling yards across the country, intended to allow the easy consolidation or breaking up of mixed wagonload trains. Unfortunately, this entire business was at precisely that moment disappearing to private road hauliers which had recently been de-nationalised out of the BTC, leaving the marshalling yards as expensive white elephants. Early on, these roundels were also produced in reverse, with the lion looking right for use on the right-hand side of steam locomotives, much as the lion on wheel totem had been. That lasted for only a short time before someone pointed out that it was big no-no to reverse the designs of coats of arms. We have these weird conventions in the UK. It’s just one of those things. The best version of all, however, was to be found on the new electric locomotives which were being introduced for use on the West Coast Main Line, which was being electrified at the new modern standard of 25Kv AC, using overhead wires. These locomotives were delivered in electric blue and featured a cast aluminium version of the lion and wheel. These are now incredibly sought-after pieces of railwayana, especially as they were produced in only limited numbers in the first place. The rest of British Railways’ corporate identity was, meanwhile, slowing descending into chaos. Although Gill Sans remained the typeface of choice for station signage, not only had the new British Railways emblem dispensed with it but so did the typeface used for the numbers on the fleets of new diesel locomotives, which carried a condensed, squashed-looking rectangular typeface. Those were delivered in green, or sometimes two-tone green, while locomotives in the Western region of British Railways were suddenly appearing in maroon, to match the new maroon carriage colour that had been introduced in 1956. Meanwhile, the Southern Region changed to painting all its trains (both electric trains and locomotive-hauled carriages) a darker green than the colour it had used before nationalisation, having finally got bored of its malachite green, perhaps. New electric trains for Glasgow were delivered in Caledonian Blue. In corporate identity terms, it was pretty much a disaster, a slowly disintegrating mess that mirrored the unravelling of the Modernisation Plan itself. There was no unifying corporate image, nothing that said this was a company trying to modernise itself to keep up with the developments in road transport, no complete identify in which staff could take pride working for British Railways. The Modernisation Plan not only did nothing to sort out the rapidly worsening finances of the railways, but probably made them worse even faster, and British Railways’ debts effectively brought the BTC to the brink of collapse. It was disbanded in 1962, its remaining constituent parts being set up as independent publicly-owned companies. The Beeching Report of 1963 dealt a hammerblow to British Railways. The government of the day welcomed the report; it saw roads as the way forward, and British Railways as a shambolic, financially incompetent drain on the state’s purse. British Railways as a brand had become completely toxic. There was only one way forward, and that was to introduce, at last, a cohesive corporate identity covering the entire company, ditching regional preferences and variations altogether, and introducing a single colour scheme, logo and typeface. The glorious Gill Sans signage at stations would disappear, so would hot dog sausage totems, so would green and maroon and electric blue trains, and so would the various lions atop or holding their wheels; everything, in short, that had come to be associated with British Railways. After extensive design work, a new train was unveiled in 1964 showcasing not only improved standards of passenger accommodation, but also a new livery and new logo, which would shortly unify the whole of what was to become British Rail, a more modern name for a company which was trying desperately to become more modern too. And that’s a story we’ll pick up in a few weeks’ time. 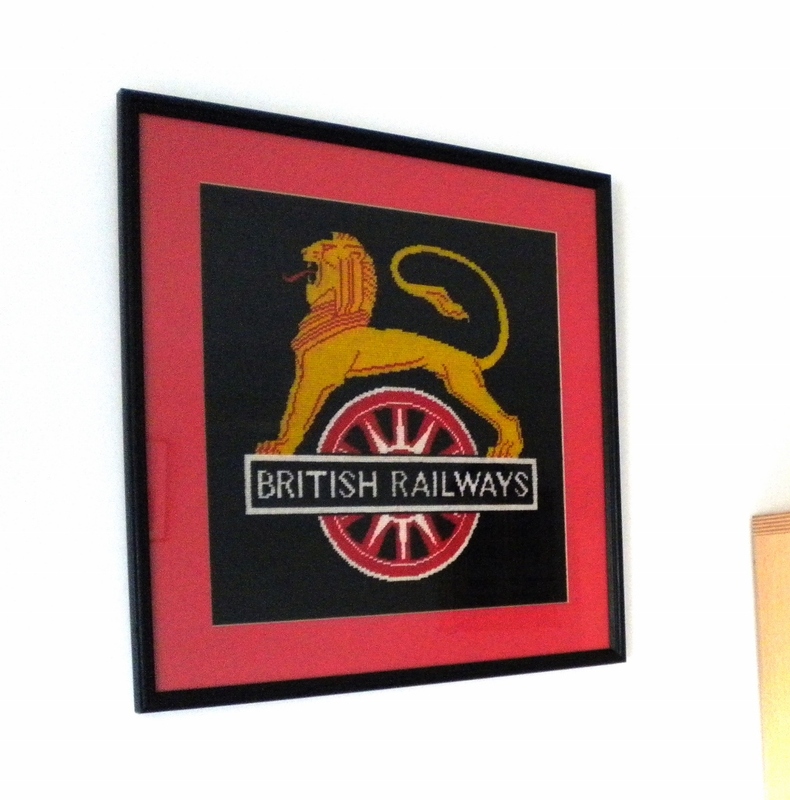 In the meantime, British Railways’ lion emblems remain highly desirable pieces of design, despite the fact that they were outdated even when brand new. They’re the kind of thing that appeals to people outside the transport industry who fondly imagine them to represent a kind of glorious lost past of milk churns on station platforms, and friendly train drivers who would wait for a delayed connecting train to make sure that passengers got where they wanted to go. You can buy badges featuring the two lion designs, or if you prefer, mugs and even baseball caps. The emblems have even been reinterpreted in other media, such as embroideries. They look lovely, too. Abram Games, Cecil Thomas and the College of Arms knew what they were up to, and could be relied upon to create visually pleasing work which translate well to other media. But at the same time British Railways was using these backward-looking pieces of design to help create its visual identity, London Transport was using much more modern branding, as were other British transport companies such as state airline operator BOAC. That was, perhaps, the most significant and most unfortunate legacy of British Railways’ lions. Article updated in January 2017 to include detail from Lawrence (2016) on the genesis of the British Railways totem and BTC crest. I have an original cast aluminium lion and wheel emblem and no amount of money would make me sell it. It has been displayed on my wall for almost 50 years. Good for you! Very wise.